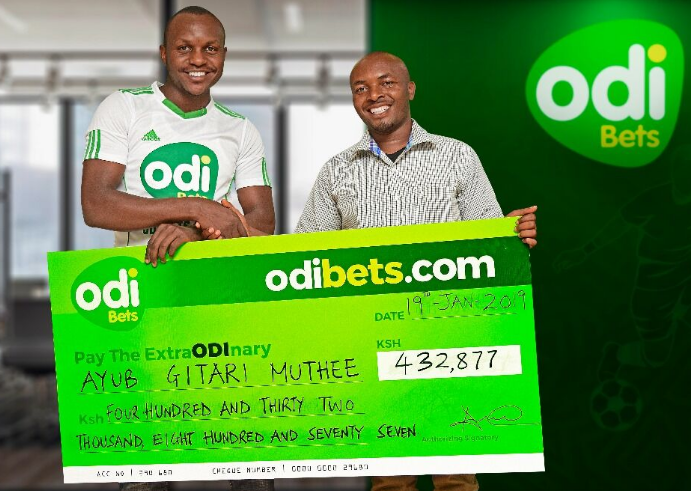 Monday, February 4, 2019- Ayub Gitari Muthee is smiling all the way to the bank after he won a mind-boggling Sh432, 877 from a 10 bob stake with Kenya’s number one gamming site-odibets. Muthee selected 23 football games with total odds of 43,288.73 which he correctly predicted and after staking Sh10, he won a whooping Sh432, 877. He could have easily been a millionaire had he staked just Sh3o as he could have won over Sh1.2 million. With odibets , you can stake any amount from 1 bob to Sh20, 000 and they have the best odds North of Limpopo and South of Sahara.